Miriam Quiambao is another beauty queen who joined local showbiz initially as TV Host/ Correspondent. Miriam was the 1999 Miss Universe first runner-up at the pageant held in Trinidad and Tobago. I remember admiring her grace and poise after her near fall during the evening gown competition. I remember watching her last on "Kung Tayo'y Magkakalayo" in a villainy role and the movie "KimmyDora." Miriam stars in a TV5 series called "Bangis." When we talk about beauty queens becoming actresses, then we shouldn't forget about Precious Lara Quigaman. Lara was after all Miss International 2005, where she won the title at the beauty contest held in Tokyo, Japan. I remember watching her last on "Mutya" and saw her in a TV appearance for a "Maalaala Mo Kaya" episode. 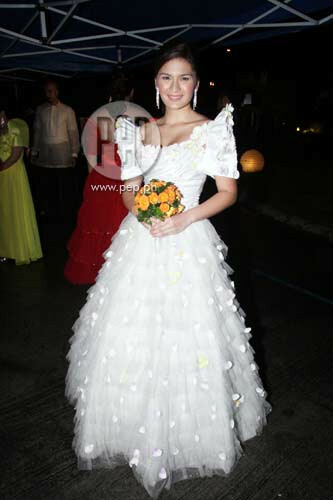 She is engaged to boyfriend Marco Alcaraz, and they're set to marry in 2012. Jasmine Curtis-Smith is the younger sister of local Philippine showbiz 'Diyosa' Anne Curtis. Jasmine is a contract star of TV5 and stars in the TV adaptation of popular 90's film "Ang Utol Kong Hoodlum," where she stars opposite leading man JC De Vera. I do not consider myself a Bea Alonzo fan, at least not until I read her story featured on Star Studio magazine. I guess that kinda endeared her to me. Bea is one of the actresses whom I would say has matured rather beautifully. She somehow just seems more beautiful now compared to her teeny bopper days. 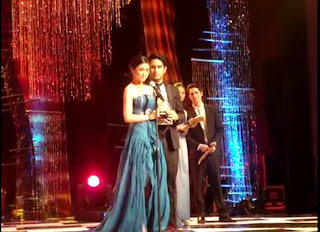 Bea is shown above receiving some awards. Her latest photo from Guns n' Roses pictorial shows a more matured and definitely more beautiful Bea. She is one dramatic actress who cries so well and delivers lines so clearly -- a rare quality indeed. ^_^ I wonder what her next project would be now that Sam Milby won't be able to work on their movie team up. 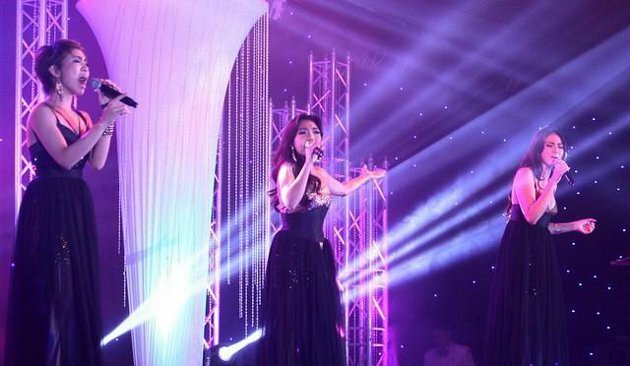 Cathy Gonzaga, the little sister of multimedia star Toni Gonzaga, is also slowly making a name for herself. Cathy is more popularly known as Alex Gonzaga, after she played a character named Alex on a TV sitcom on ABS-CBN. She has since moved to TV5. I used to watch her on Juicy and find her really funny and refreshing. It's good to see she's starting to make a name for herself. Mega Publishing Group held the second annual Mega Pinoy Pride at the Makati Shangri-la Hotel this year. The event showcased Filipino talent, homegrown cuisine, and enchanting original Pilipino Music in a night of Filipino revelry. Photos above: Bella Padilla and Alex Gonzaga, Angel Aquino who co-hosted the event with Tim Yap, Phoemela Baranda, and Pops Fernandez -- love her pink terno! ^_^ I think we should have more events highlighting the Philippine national costume. 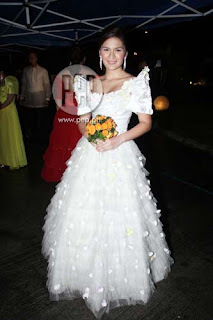 And I almost forgot Carla Abellana, another GMA-7 Kapuso network artist. Carla is the daughter of former actor Rey "PJ" Abellana. She was launched in the TV remake of "Rosalinda." She also co-starred with Lovi Poe in the movie "My Neighbor's Wife." Carla was previously awarded the Best New Female TV Personality by the 24th PMPC Star Awards for Television (2010) for her role in "Rosalinda." More pictures found from various past awards nights. Seen above: Kim Chiu, Toni Gonzaga, and Angel Locsin. 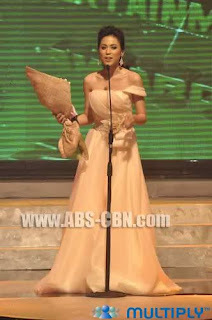 I would love to see Kim Chiu receive more awards esp. for acting as she has turned into one fine actress since her PBB Teen days. Toni Gonzaga is undoubtedly a multi-awarded personality as I consider her to be the finest host among her generation of stars. 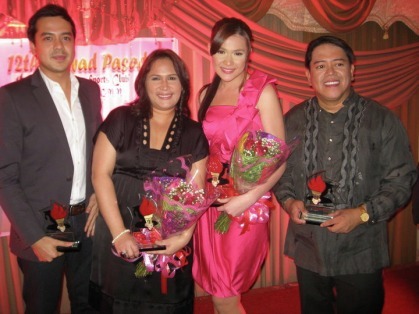 Angel shown above receiving her first acting award from PMPC. 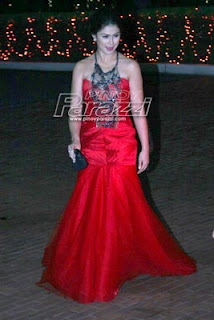 Photos are from the red carpet launch of Profiles Magazine held at the Makati Shangri-La Hotel. (Marlo Cueto/NPPA Images) Shown above are Kris Bernal (my Kapuso star fave), Aicelle Santos, Jonalyn Viray and Maricris Garcia of La Diva perform a song number. I found this on a Yahoo! site featuring some of the fabulous fashionistas of local Philippine showbiz. Ruffa Gutierrez, Anne Curtis, Angel Locsin are featured in the above photos. Pauleen Luna used to be an ABS-CBN Kapamilya star but has transferred to GMA-7 Kapuso network. 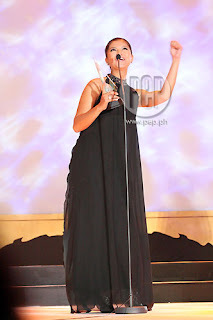 She has been one of the regular hosts of the long-running Eat Bulaga!, a noontime variety show on local Philippine TV. To date, Pauleen is a familiar face on GMA network TV.